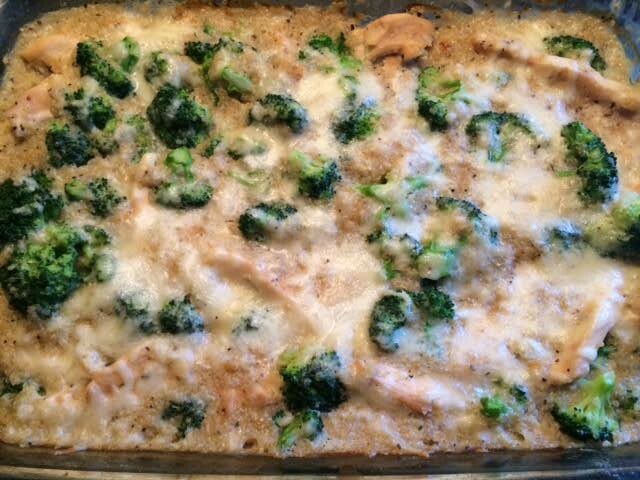 Chicken, broccoli, and quinoa casserole | Om nom nom! I’m not usually a big casserole person (aversion to cream of x, and I do try to stay low carb), but then I saw this – spurred on by this month’s Cooking Light with a similar casserole using brown rice, but we had some quinoa and it sounded good. I found this on Pinch of Yum, and modified it a bit with less liquid and no bacon (I know, I know). It was very good! Perfect for lunch. 2 teaspoons additional seasoning – I used a Penzey’s mix, but poultry or anything you like would work. Preheat the oven to 400 degrees and generously grease a 9×13 baking dish (seriously, be generous because it really really sticks to the sides). Bring the chicken broth and ½ cup milk to a low boil in a saucepan. Whisk the other ½ cup milk with the poultry seasoning and flour; add the mixture to the boiling liquid and whisk until a smooth creamy sauce forms. In a large bowl, mix the sauce from step one, one cup water, and quinoa, and stir to combine. Pour the mixture into the prepared baking dish. Slice the chicken breasts into thin strips and lay the chicken breasts strips over the top of the quinoa mixture. Sprinkle with the seasoning. Bake uncovered for 30 minutes. While the casserole is in the oven, place the broccoli in boiling water for 1 minute until it turns bright green and then run under cold water. Set aside. Remove the casserole from the oven, check the mixture by stirring it around in the pan, and if needed, bake for an additional 10-15 minutes to get the right consistency. When the quinoa and chicken are cooked and the sauce is thickened, add the broccoli (and, if necessary, a bit of water) until the consistency is creamy and smooth and you can stir it up easily in the pan. Top with the cheese and bake for 5 minutes, or just long enough to melt the cheese. I think you guys would like it! Great leftovers, had it for lunch almost every day this week!